The United States is the most litigious nation on earth, and because of that manufacturers are constantly on guard to cover their rears with “Don’t do this or that, because you may hurt yourself if you do” stickers. Cars are one of the prime beneficiaries of these stickers. I decided that I did not need a warning on my sun visor reminding me about the danger of Air Bags, so I decided to remove them. 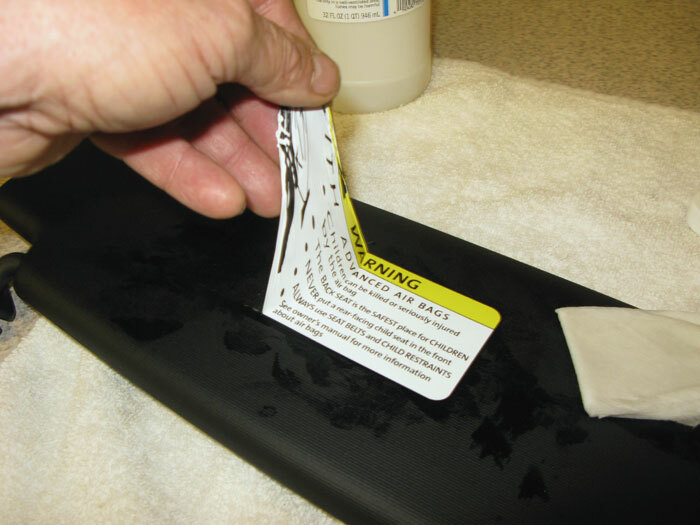 Here is a set by step DIY on how you too can remove these stickers if you choose to. [Gratuitous warning sticker] Remember, do this at your own risk. Not my problem if you screw it up. This process will work with just about any sun visor sticker, not just the GTI’s. 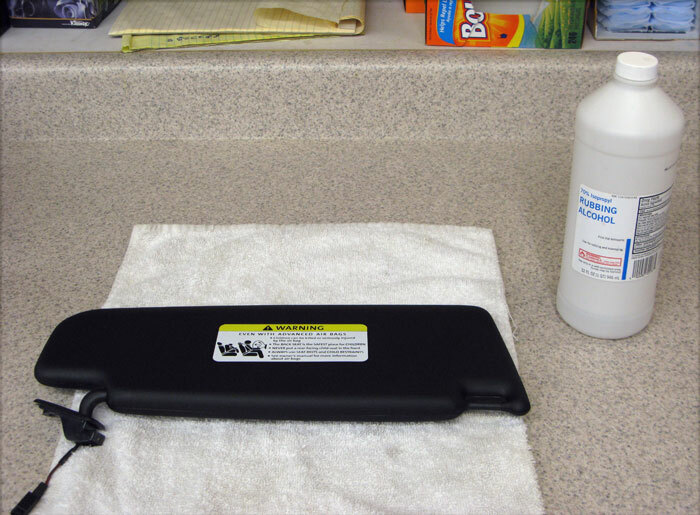 The process is essentially remove the sun visor so you can lay it on a flat work surface, soaking the sticker with 70% Isopropyl Rubbing Alcohol, pull the sticker off, then soaking the residual adhesive to remove it, polishing the sun visor, and then replacing it. First remove the sun visor. 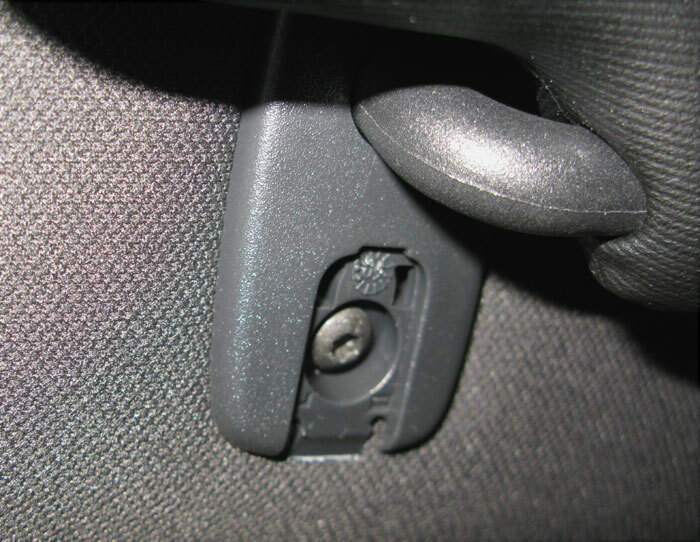 It is held in with one Torx screw behind a small cover. 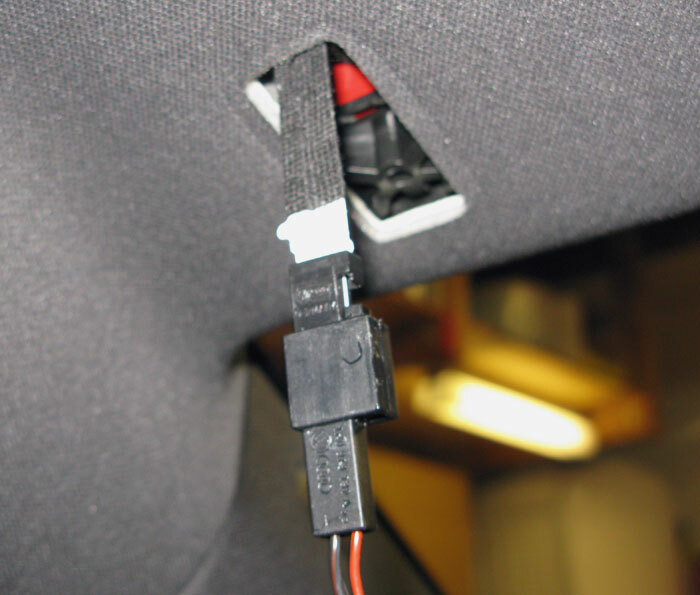 Gently pull out the sun visor exposing the vanity mirror switch cable, and disconnect the connector. 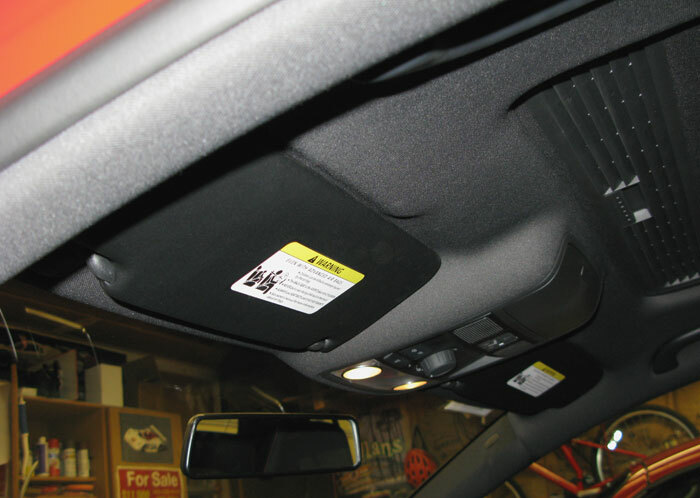 Lay the sun visor on your work bench, sticker side up. 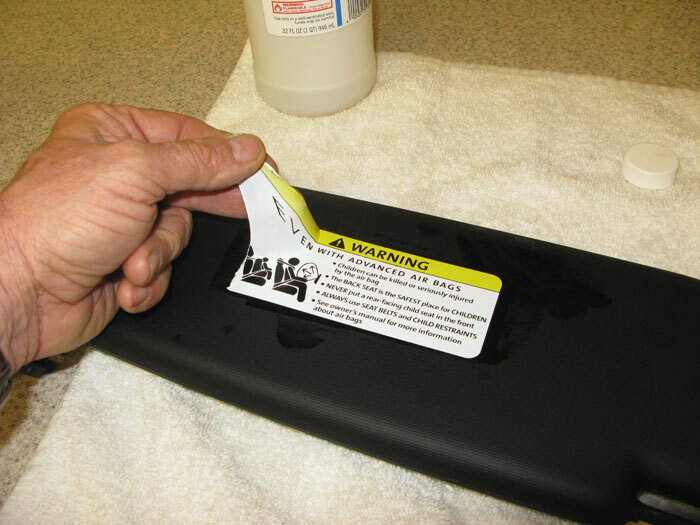 Next take a piece of paper towel, fold it to the size of the sticker, soak it with Rubbing Alcohol and place it on the sticker. Keeping the paper towel wet, let the alcohol soak into the sticker for about 15 ~ 20 minutes. Then start to peel off the sticker starting from one side, gently pulling it off. If it has soaked sufficiently, you should be able to pull it off in one piece. 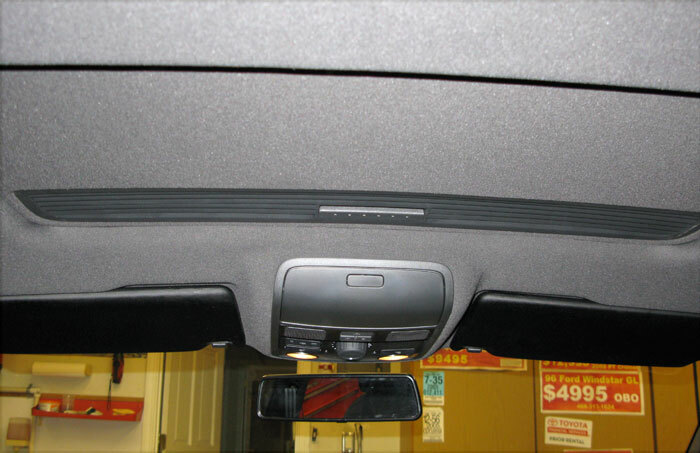 After you have the sticker peeled off, there will be residual adhesive still on the sun visor. 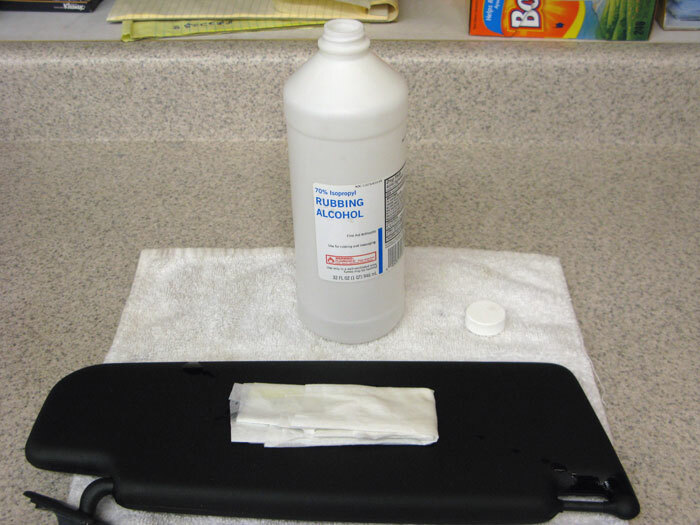 Soak your paper towel in Alcohol again, place it on the adhesive, and let it sit another 10 ~ 15 minutes. Then you can start to remove the residual adhesive. Be patient as the adhesive is quite tenacious. It will come off, but will require some rubbing. 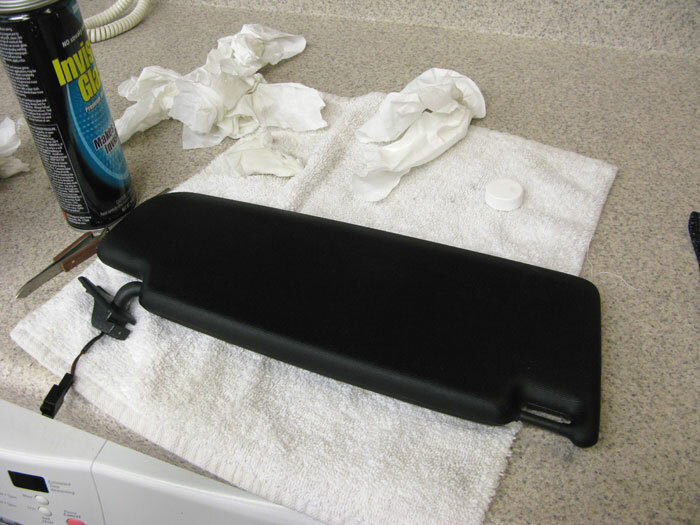 After you have the adhesive removed to your satisfaction, clean the sun visor off with some vinyl cleaner polish. Replace the sun visors and you are good to go! Did the alcohol discolor the visor at all? I have done this with Mk3 black Cabrio visors and sometimes there is still the outline of where the sticker was. Though perhaps that was from age. Just clarifying. When I get my Mk6 in a couple months, this would be something I might do (along with debadging the rear GTI emblem right away). It seems better to do things like this when the car is new rather than waiting 10 years to find permanent fading after removing such things. From your pictures (using a flash) I wasn't aware that the visors were truly black. I though everything in the interior was the anthracite dark gray color. Very helpful write up. It's the little things that make all the difference. I used Invisible Glass to get stubborn residue off, but I use a product from Adams Car Care Products called "VRT" which is a vinyl, rubber & trim protectant to even out the sheen of the visors. This stuff can be buffed out so it does not give the gloss look that many vinyl cleaners give. Just did it. Right on. come off nicely JT? Always nice to hear from a 2nd source that it worked out well! Once I have my car, I think I might try doing this without removing the visor - using plastic wrap to hold the soaked towel in place. I learned to do this from a Mini forum when we got ours-those guys used a Q-tip dipped in alcohol with the visor in the car. It takes a while longer to do a VW that way as the stickers in Minis are brittle and break into pieces instead of pulling off. Using goo-gone will get the adhesive off without rubbing as much, and more importantly reduces the visor's exposure to 70% iso, which helps reduce the staining effect on some visors. Followed the steps and eventually everything worked out. The adhesive itself was very difficult. I tried Goo Gone and it didn't work very well, so I went back to alcohol and elbow grease...both kinds of alcohol :cheers: . However, I needed to use the car during the process (without visors). Now the car is complaining about the lighting system (warning lamp on dash), even after I re-installed the visors. Guess I'll have to get out the OBD-II/CAN reader. Good point, be sure not to turn on the car when you have the visors removed as that will generate a fault code! Just did this myself, looks a 100x better but were you able to remove the adhesive completely to the point you cant even see the outline in direct light? I also have yet to use the vinyl polish so maybe that will take it from 95% to 100%. Just did this myself, looks a 100x better but were you able to remove the adhesive completely to the point you cant even see the outline in direct light? I probably should have spent more time on the adhesive. I can still see a faint outline in direct light, however, the vinyl conditioner did help a lot. When I saw this post, I knew immediately I had to do it... Overall, all steps are fairly easy and straightforward with one exception. After the label peels off, it is a real challenge getting the adhesive off and it leaves an outline. In my view, this is better than a big yellow label and the outline is only barely visible. Many thanks to the OP for this fantastic post. Yes, getting all of the glue off can take time.